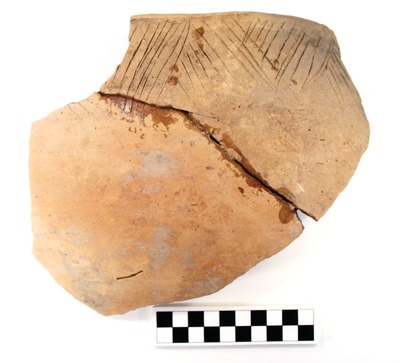 "41HS269, 2003.08.910" by Timothy K. Perttula and Robert Z. Selden Jr.
DECORATION (INCLUDING MOTIF AND ELEMENTS WHEN APPARENT): The rim from this large vessel is decorated with an unknown number of incised chevrons. The vessel of the body is plain. Large rim and body sherd from Maydelle Incised jar, unidentified burial at the C. D. Marsh site.